Interested? Contact Emily Kaiman at 404.531.0801 or ekaiman@ramahdarom.org ASAP. There’s nothing like celebrating the holiday of Pesach at Ramah Darom. Families from all over the globe gather together with us to create a marvelous extended family and community. Our all-inclusive holiday has everything you need to celebrate a meaningful, fun and relaxing vacation with family and friends – new and old. Enjoy a rare opportunity to spend time learning and exploring Jewish life, culture, texts and history with a diverse mix of distinguished scholars, leaders, and thinkers. Our communal Seders are led by engaging, scholarly rabbinical leaders. You may also choose to enjoy your own semiprivate Seder with space reserved just for your group. Throughout the week you can choose from hundreds of programs, trips, activities, and lectures, including everything from woodworking and fly fishing to waterfall hikes and campfires! Year after year, our Passover family comes back for this extraordinary, unique family retreat. To submit a payment towards your confirmed Passover 2019 Reservation, please click the button below. View last year’s Passover Schedule. Our cabins are modern, clean and feature hardwood floors with a screened-in porch and bathroom(s) for each cabin. 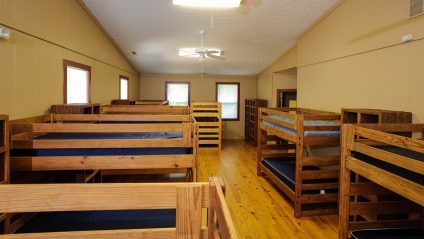 Each cabin has both an open area with dorm-style bunk beds and a private room with twin beds. We offer deluxe, single family, and multi-family cabins. Please click cabin type below for more details. We have four deluxe cabins available, in our new ADA accessible building. Each cabin has a main room with 4 bunk beds, a smaller room with a door and 2 twin beds, and a private bathroom with walk-in shower(s). This building is located on the mountainside. These cabins are available for parties of 2 adults and 1 child or more. Our single family cabins are separated by a sliding wall and are available on the lakeside. 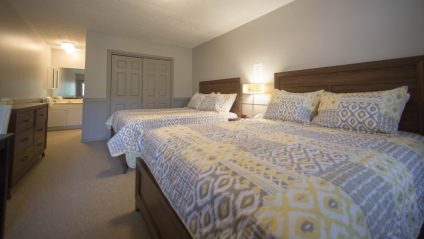 Each single family cabin has 1 private room, 1 main room with 4 bunk beds, and a private bathroom with walk-in showers. These cabins are available for parties of 2 adults and 1 child or more. These discounted cabins are ideal for extended families or friends coming together to Pesach. 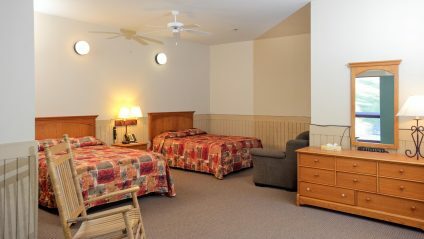 Multi-family cabins have 2 private rooms, 1 main room with 8 bunk beds, and a shared bathroom with walk-in showers. There are 2-4 cabins per building. Cabins are available for parties of 4 adults and 2 children or more. ** Please contact us for a discounted “Family Reunion” rate if you are an extended family of 3 or more families in one Multi-Family cabin. See all housing options above to the right of “cabins”. Standard Hotel Rooms are comfortable, private rooms, each with 2 queen or full beds, table & chairs, bureau, and private bathtub shower with standard amenities. Limited availability with balcony upgrade. We have 2 standard hotels, Marcus Lodge (ML) and Mountainside Hotel (MSH), both located on the mountainside. If 2 parents would like a separate (next door) room for their children, each parent will be charged at a Single Adult Occupancy rate. Deluxe Hotel Rooms are bright, oversized rooms with relaxing, communal lobby and upgraded amenities. Rooms feature 1 king or 2 queen beds, table & chairs, bureau and private bath (some walk-in, most are deluxe size bathtub showers). These rooms sell out fast! We have 2 deluxe hotels, The Welcome Center (WC) and Lakeside Hotel (LS). Those with physical disabilities and mobility issues will be given priority in The Welcome Center. Each room is priced per adult occupancy. If 2 parents would like a separate (next door) room for their children, each parent will be charged at a Single Adult Occupancy rate. See all housing options above. 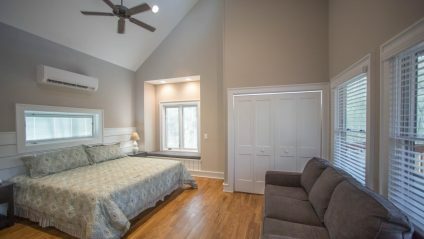 Our new, beautiful 1 room houses have a kitchenette, private patio, bathroom with walk-in shower, and a king-sized bed. PLEASE NOTE: There are four 1-bedroom cottages are available, and there is one 2-bedroom cottage available (may only be reserved for 2 or more people). Please click on full, first 1/2, or second 1/2 to see rates based on guest occupancy, age, and accommodations. Deposit with reservation of $500 per adult is required. FULL BALANCE OF PAYMENT DUE BY FEBRUARY 1, 2019 or reservation is not guaranteed. We strongly recommend the purchase of travel insurance for your deposit and reservation in case of changed plans or unanticipated cancellations to receive a refund for deposits or reservations after any cancellation policy dates. We are happy to assist all guest in procuring trip protection/travel insurance. Please indicate in the form below if you will be purchasing your own insurance or if you would like Ramah Darom to assist you in purchasing trip protection. Staff gratuities are intended as supplemental compensation for our hard-working part-time seasonal staff (waiters, kitchen staff, housekeeping, shuttle drivers), all of whom work long hours at hourly rates. Your final Passover invoice will include a line item for staff gratuities in the amount of 2.5% of your reservation total. This is a minimum guarantee, but guests are always welcome to leave additional gratuities if so inclined.